Corsair on Thursday announced a new portable mechanical gaming keyboard. Dubbed the Corsair K63, the board features a tenkeyless design (no numerical keyboard), gold-contact Cherry MX switches and a full complement of dedicated media keys. The Corsair K63 packs the popular Cherry MX Red switches which offer a light, linear feel with an actuation force of 45g. Red switches are common in gaming keyboards as they excel in fast action sequences and afford minimal resistance. 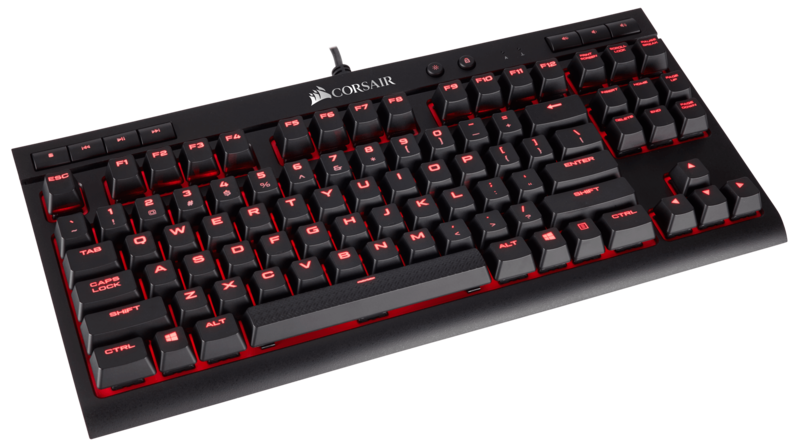 The board also features per-key red LED backlighting that can be controlled individually using Corsair’s Utility Engine application. The software further allows users to reprogram every key individually should they want to create alternate commands, macros or dynamic lighting effects. Other noteworthy features include 100 percent anti-ghosting with full key rollover and large font keycaps. Unfortunately, due to its size, there isn’t a USB hub or built-in headphone jack. Speaking of, the board measures 365mm x 171mm x 41mm (14.37” x 6.73” x 1.61”) and tips the scales at 1.12kg (2.47 pounds). Across the top of the board is where you’ll find a full set of dedicated volume and media keys, an addition one might not expect on a keyboard designed with portability in mind. The Corsair K63 compact mechanical gaming keyboard is available as of writing priced at $79.99. You can pick it up through Corsair’s online store or at various authorized retailers.